Enter the FTP details from your WebMate welcome email in to the Transmit setup page, you can use FTP or WebDav, details for the FTP method are below. 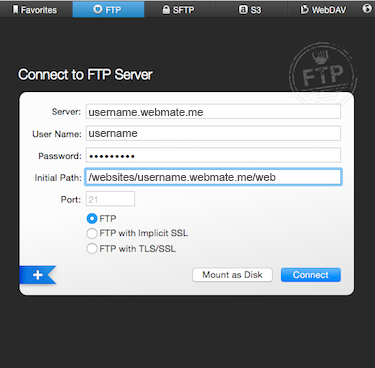 Step: #1: Setting up Transmit & FTP to WebMate. IMPORTANT: Replace "username" with your username, for example "charlie.webmate.me" or "charlie".